Have you ever wanted to get away from civilisation? Just run away into the middle of the Amazonian jungle with only the parrots, turtles and tapirs for company? At Napo Wildlife Centre you can do exactly that. This luxury 20 room Ecuadorian eco-lodge in Yasuní National Park is so remote it can only be reached by boat and is surrounded by the luscious green of the rainforest. Run entirely by the local Añangu Quichua community, Napo allows you to completely disconnect from your everyday routine and instead immerse yourself in the Amazonian way of life. Getting to Napo is part of the adventure of staying here. It is in the beautiful Yasuní National Park, a UNESCO protected biosphere site. A two-hour motorised boat journey down the Napo River from the city of Coca is the first step. During the boat ride take in the majesty of the Amazon and keep your eyes peeled for all 610 species of bird that live here as well as monkeys, tapirs, anacondas and if you’re lucky maybe even a jaguar. You then transfer to a dug-out canoe for an equally wondrous hour long meander down a stream that connects to Lake Añangu where your jungle hideaway awaits. 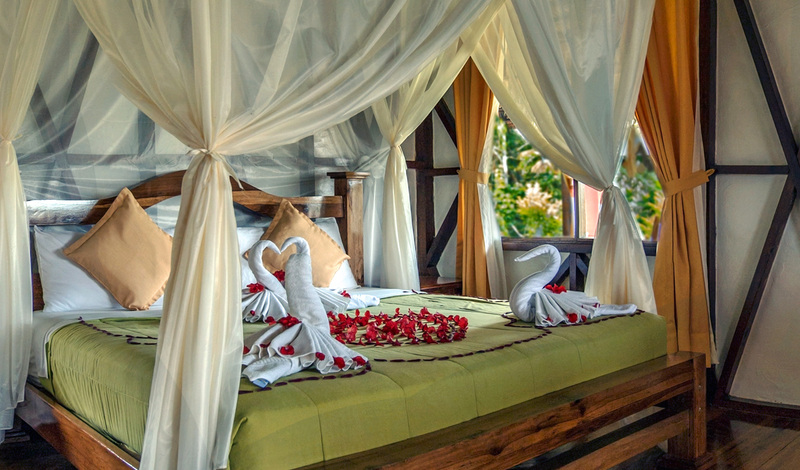 The 12 cabins and eight suites at Napo blend seamlessly with their rainforest surroundings by using dark wooden furniture and floorboards, and a white, green and yellow color scheme. They each have a private balcony that looks out over Lake Añangu and the Amazon. The suites are especially spectacular and feature a luxurious Jacuzzi on their terraces and a glass floor to aid you in your wildlife spotting. 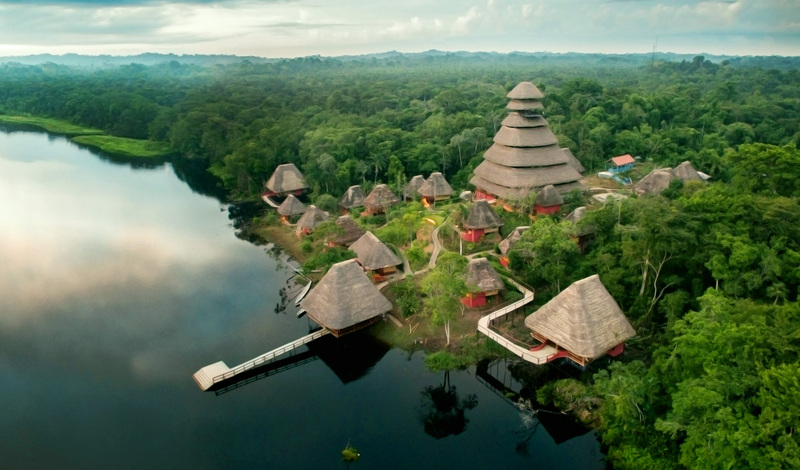 Napo Wildlife Centre is both an impressive structure and concept, with the centerpiece of the property, the Ecological Tower, opening up to incredible panoramic views of the rainforest. Having been built and run by the local indigenous community, Napo supports and doesn’t damage the local way of life; all of Napo’s jungle tours have the most knowledgeable guides because they were born and raised in the Amazon – be sure to see the unusual Parrot Clay Licks with them. Napo also has an Interpretive Centre where women of the Kichwa community teach guests about their customs and way of life. So, if you want to experience the Amazon rainforest properly, Napo is the place to do it.